Bread and butter pickles are so simple to make...and a perfect accompaniment for sandwiches. The fresher the cuke...the better the pickle! Fill an empty 1 gallon bucket with cucumber and onion slices. Combine remaining ingredients and bring to a boil. Simmer for several minutes. They are ready to eat when they change colour. They are the best addition to sandwiches! 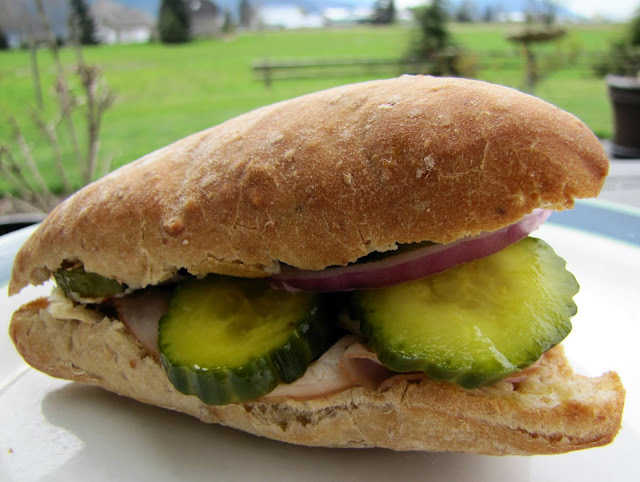 Cuke season is upon us...a good time to try these simple bread and butter pickles. And even when the fresh garden cukes are no longer available...these pickles can be made year-round using long English cucumbers. Anneliese and Lovella will be at the Berean Christian Bookstore in Lancaster, PA tonight at 7 pm ... and would love to meet you if you live in that vicinity. I will have to try this! I am a no-can kind of gal, I only freeze produce...so this recipe is right up my alley! Thanks! Im not sure i can eat a sandwhich without pickles.Richard from Amish Stories. thanks so much for this recipe.I love bread and butter pickles and will definitely be making these! Used to make these by the ice-cream pail full during the years the kids were still all at home! Even used zucchini instead of pickles! Good recipe! I make a no-can bread and butter pickle in the microwave. 5 cups of sliced cukes, 1 small onion sliced, 1/2 cup of vinegar and 3/4 cup of sugar. 1/2 to 1 tsp each of celery seed and mustard seed. 1 tsp of salt. Put all in a large microwave safe glass bowl. Nuke 3 minutes. Stir. Nuke another 4 minutes or until tender/crisp. Put in 1 quart canning jar and refrigerate. Yum! I was looking for a good pickle recipe, but I was wondering if I can CAN them? I am sure I missed something...how many cups of cucumber slices are required? I can't wait to try these, I always thought pickling would be too involved. My daughter loves bread and butter pickles, and we've just picked some at a local farm, so we'll make them together. How fun! 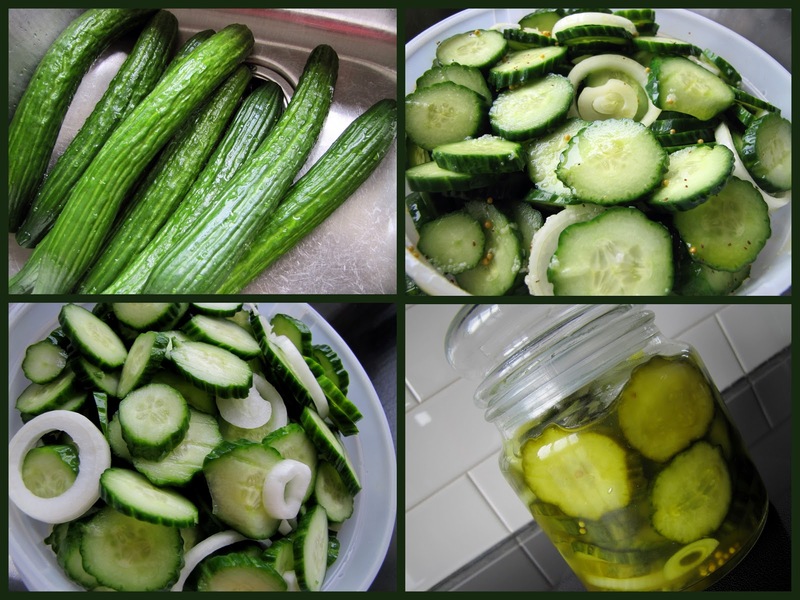 To Anonymous (wondering how many cucumbers to use)...fill a one gallon container with slices. With long english cukes, I have used about 7 or 8. With pickling cukes...probably about four pounds. Katie...I have not tried canning this recipe. It was SUCH a pleasure to meet you this evening! 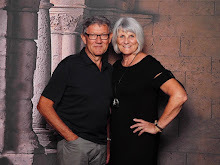 You both are warm and wonderful as you come across on your blog. Thank you for visiting our neck of the woods! Who knew! I love bread & butter pickles and have never made them. Thanks again! Just wanted to say to Sara Beth that, yes, you can can these...simply put into jars when all heated through, put on snaplids, close and steam in canner for about 10-15 minutes. I really want to make these. Please answer 2 questions: you say boil the brine several minutes...how many? (and) you say they are ready when they change color...can you give us an approximate time? days? weeks? Thank you (I'll be watching for your answers). Collen...I'm not sure how this comment slipped by me when it was published, but I just saw it here now. Boil the brine for 2-3 minutes. The pickles can be eaten the next day...but they get better as the days go by! Judy we have a group on another web site that is all about pickles. I posted your pickle recipe on there and put your name on it to give you credit for it. I hope that was ok??? Next time I will remember to ask first (didn't even think to ask, it is such an easy recipe I knew they would love it). Made these last year and loved them! Substituted part of the sugar for splenda in one batch and just reduced the sugar a bit in another. They were all delish. Is it possible that they are ready 24 hours after making? Mine are nicely yellowed and tender already and I just made them yesterday. They even already taste like bread and butter pickles to me. Made these today. look wonderful. the cucumbers filled the jar but once the hot fluid went on them, they shrunk to just over half so a lot of liquid on bottom. Anyone else find this happened? Think that is fine but always nice to hear about other's experience. They DO shrink after the solution is added...but no worries...they will taste great! Made again today. These are truly fantastic. Really jammed the cukes and onions in this time 'for shrinkage' ))) Gosh these are great. The hub loves them. Love these pickles. I made them with Persian cucumbers and they turned out fabulous. Now I know I can make them all year round when pickling cucumbers are not in season. Everyone loves them :) So good on sandwiches or diced up in potato salad.